This is a wonderful expression of art living with the community. A wonderful small bronze and sandstone piece that so vividly describes the battle of developing the synagogue, and recognition of a culture, within this town and region. The Jewish faith abounds with these stories of oppression and meeting challenges. One cannot help but admire these achievements, but in the same light it shows ho it is part of human nature to strike out at achievers and those that do things a little differently. 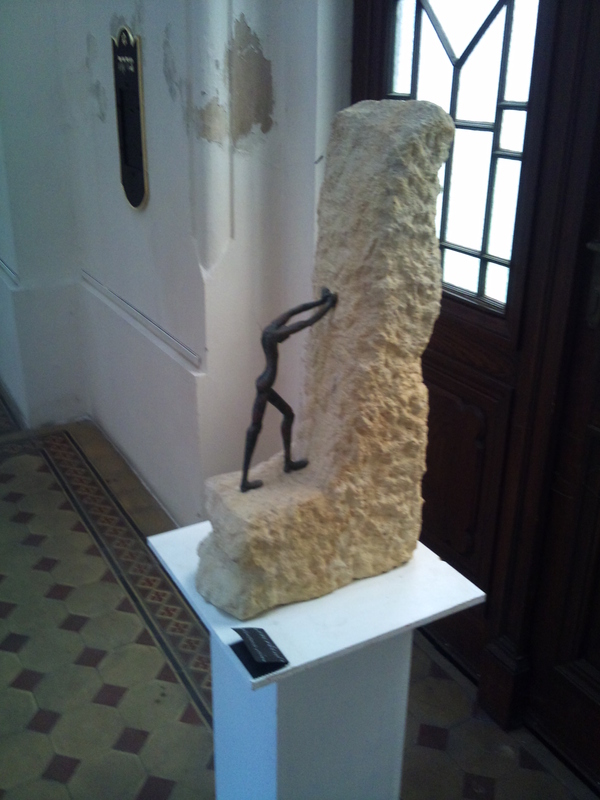 This piece is in the Plzen synagogue (May 2014) along with other small bronzes, equally expressive of the then and now. This piece is only about 500mm high in total, the figure about 200mm, but the lines of the body express strongly that defiance and will of mind. A memorable piece. It is becoming quite common for places of worship to display modern art that expresses the history of the culture associates with the supporting culture. For me this has become an improvement, helping to explain the background, purpose, place. Since their period of oppression (during 2nd World War to 1989 when Russians left) photos and word-of-mouth indicates to me the cleanup and progress has been massive. Even though no-one would have liked to be in the Czech’s shoes during this period, it does seem to have given them great drive to achieve, what could be seen as an advantage in Europe … they are not just working for money, but also to prove what Czech can achieve, how productive they can be and how strong a culture they have. This photo of Techmania in the Skoda precinct is indicative of the targets being set and the investment being made in education and research. Technology and science are foremost in the Czech future. A wonderful piece of public art by David Cerny is housed in this building – a statement on each European nation. One of 4 public art pieces in namesti repiublicka (city centre square). This one represents the camel in the Plzen coat of arms, the other 3 being the saint, the greyhound and a religious emblem. The camel, greyhound & saint are all gold plate water features, command attention and motivate the question “what do they represent?” Their size, scale and joyful nature seem to accurately represent the way in which Plzen is going about their business of creating a cultural centre.